Parties have the potential of being legendary. Sure, there are parties that you may remember the day after, but then there are parties that last a lifetime. At Rythm EFX, we strive to offer your party, concert, or event special effects that will transform your little gathering into a huge memorable moment in your life. Parties always have the potential to be fun, but having special effects to excite and mystify you, only adds to the experience. In this blog, we are going to give you a rundown of the top benefits of having a foam party. On our site, you can see our foam machine rental and determine if this technology is right for you and your event. However, we have yet to find an event where a foam machine doesn’t liven up a gathering. When using a party prop or special effects, you will want to make sure that none of your guests can be injured or harmed — obviously. 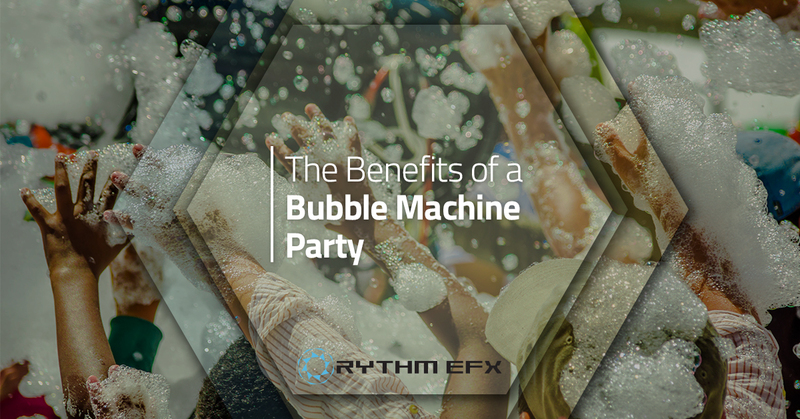 Foam parties with Rythm EFX are always fun because we use a hypoallergenic soap that is gentle on all skin types. Because of this, everyone is included in the fun, no matter how sensitive they are. Our foam is also water based, so on the hot summer night you have a party, the foam can be extremely cool and enjoyable. Besides, half the fun about foam parties is that you can get drenched in bubbles! Parties, unfortunately, have to end — this is sad but true. And, parties aren’t always fun to clean up, either. Depending on the size of your party, clean up can take hours, even days. However, with a foam party, clean up is simple and easy. Instead of picking up tiny bits of paper confetti pieces, our bubble and foam machine produces sweepable bubbles that can be carried off to the garbage, or they can naturally dry out. It is important to remember that if the foam is left to dry out on the dance floor, it can get the dance floor a little wet. Because it is water-based, it is natural that it will get the floor a little wet. It does not require tedious clean up processes. And it is okay to use in any setting. Due to the fact that our bubble machine has biodegradable soap and leaves no scar on the environment, it can be used in parks, stages, and in auditoriums. Because it is safe and easy on the environment, you can have peace of mind that you are not damaging the environment while you are celebrating an event. Our bubbles leave behind no soapy residue, which means that the texture or integrity of your floors will not be sacrificed for the sake of one night’s party. However, as stated before, the floor can get wet from the water-based bubbles. Because of this, technically your floors can get slick, but no slicker than plain water on the floor would be. Best of all, our foam washes out of clothing, which means your party outfit doesn’t need to be ruined after one night. This can save your guests the sudden anxious fear that they have just ruined their party clothes. If you are interested in our bubble machine for rent, contact us today. We can help you set up the machine and teach you how to use it for your corporate function, party, or special event. With our foam machine, you can amplify your guests’ party experience. Contact us if you are interested.